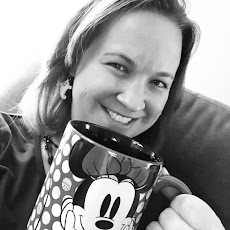 Running on Pixie Dust: Can You Handle The Kitchen Sink?? Can You Handle The Kitchen Sink?? There are several things that any Disney fanatic will tell you should be on your "must conquer" list at some point during your Walt Disney World vacations. In November, we tackled one of my bucket list items - the Kitchen Sink Sundae at Beaches and Cream. Beaches and Cream is located poolside at Disney's Beach Club Resort just outside of Epcot. It's a great place to visit on your Epcot park day as you can easily exit Epcot through International Gateway, turn to your right, and you're just a short 5 minute walk away. 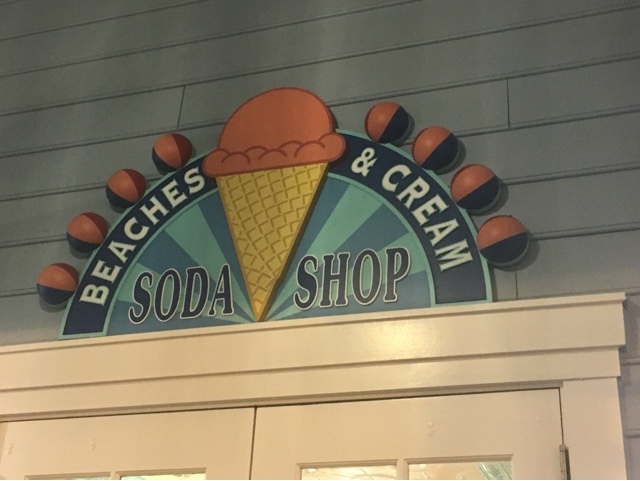 While Beaches and Cream serves a full menu of lunch and dinner items, they are best known for their ice cream. 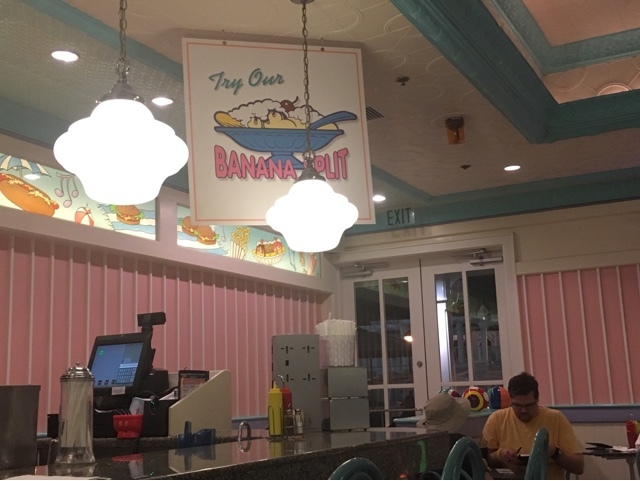 The decor is reminiscent of a 1950s soda shop and features diner favorites, such as grilled sandwiches and fries. We had dinner in Epcot and then made a 7:30 reservation for Beaches and Cream to grab dessert prior to going back for Illuminations: Reflections of Earth. Reservations are tough to grab for this restaurant as the inside seating area is extremely small. There is a "carry-out" side of Beaches and Cream if you can't get a reservation inside. They feature a smaller version of the kitchen sink sundae then what you'll find inside, but they host a full compliment of ice cream flavors. Upon being seated, our server quickly greeted us and we shared that we were here with one thing on our mind - the Kitchen Sink. He was happy to fill us in on all of the delicious details. We have a picky eater in our family and our server even offered to "deconstruct" the sundae a bit and put some of the ice cream in a separate dish so that Brody could enjoy a plain treat if all of the sundae toppings were too much. After placing our order, it was just a short wait for the arrival of our dessert. And it arrived in grand fashion. The lights in the restaurant dimmed and sirens went off to signal that a brave table was attempting to conquer The Kitchen Sink. So what's in this sundae you ask? It features ice cream, whipped cream, hot fudge, cake, brownies, sprinkles, candy, and so much more. The full list of what's included can be found on the Disney Parks Blog. It was heaven in a bowl. We didn't quite finish the masterpiece - actually we didn't even come close, but it was enjoyable down to the last bite that we could manage. 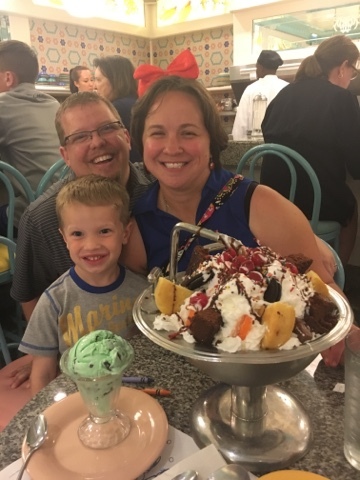 At $32.00, the Kitchen Sink is a heavy hit to the budget, but when you think that it can easily serve a family of 4+ as opposed to paying for four individual desserts and that it's probably a splurge for a special occasion, it really isn't too terrible of a price for you get. What do you think? Can your family conquer the Kitchen Sink? Don't forget one of my favorite sayings for all of your runners out there. . ."I run Disney so I can eat Disney!"